You can find coffee co-mingled with spice in other cultures, such as cardamom scented Turkish Coffee and Café Olla, a Mexican coffee brewed with a touch of cinnamon and piloncillo sugar. Pierre Hermé also writes about a haunting memory of a coffee served with an accompanying piece of crystallized ginger, which prompted him to create a cake. 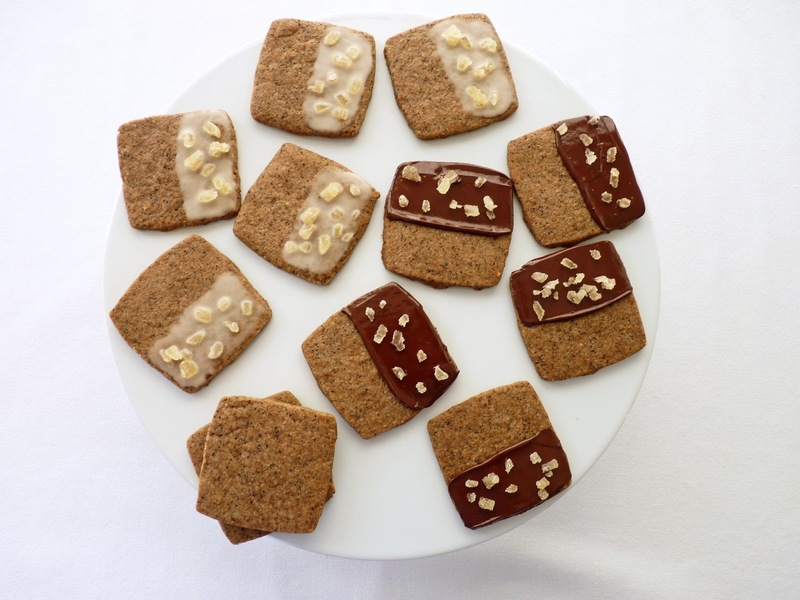 These cookies from Bon Appetit are a play on this theme. They're crisp with an unusual and aromatic blend of coffee, ground ginger, cinnamon and cardamom. They’re sweetened with brown sugar and bursting with coffee flavor. They are decidedly adult. 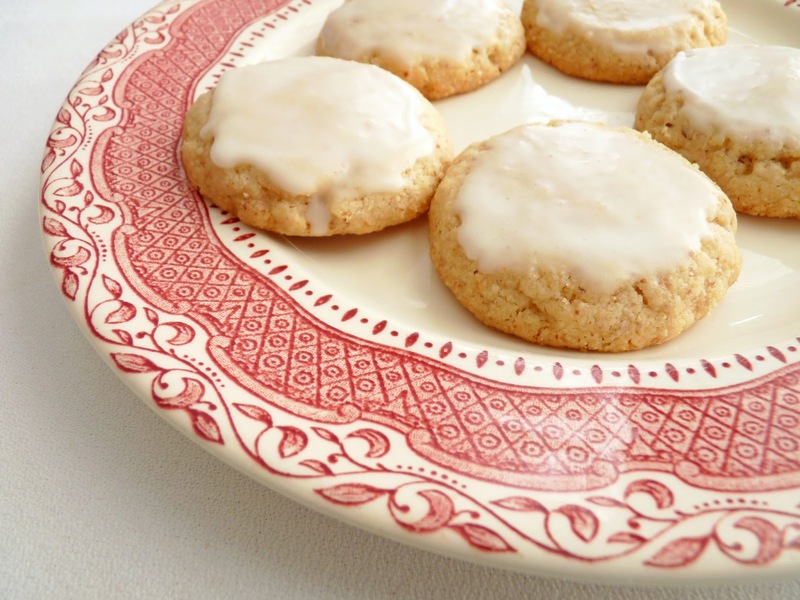 The recipe includes a simple glaze and a super garnish of crystallized ginger. I also tried them with a smear of chocolate. But I must say I prefer the original recipe’s glaze, which I think enhances rather than masks the complexity. The crystallized ginger really pops and adds to its distinctive and unusual flavor. I wouldn’t necessarily call them a shortbread but they do have a good amount of butter and are similarly baked at a lower temperature for a longer time than most cookies. If you’re looking for a very unusual cookie full of spice and a satisfying burst of java, you may want to add this to your stack of curiosities. - The recipe calls for baking in two 9” tart pans with removable bottoms but I made them into cookies using a 2 1/2 “ square cookie cutter. If you use the tart pans, divide the dough equally between the two pans. Press it firmly and evenly onto the bottom of each tart pan. Instructions say to bake at 325 degrees F for about 25 minutes, then rotate pans and continue to bake until golden brown and firm around edges with a center that is still just slightly soft, about 20 minutes longer. Cool shortbread in pans for about 5 minutes. Remove pan sides. Use a sharp knife to score the warm shortbread in each pan into 12 wedges. Cool completely. Spread the glaze thinly, leaving 1/2” border at edges. Garnish with crystallized ginger. Let the glaze set for about 1 hour. Slice into 24 wedges. - For the glaze, I sift the powdered sugar into a bowl of 2 teaspoons of water to avoid lumps. Then I add the vanilla. 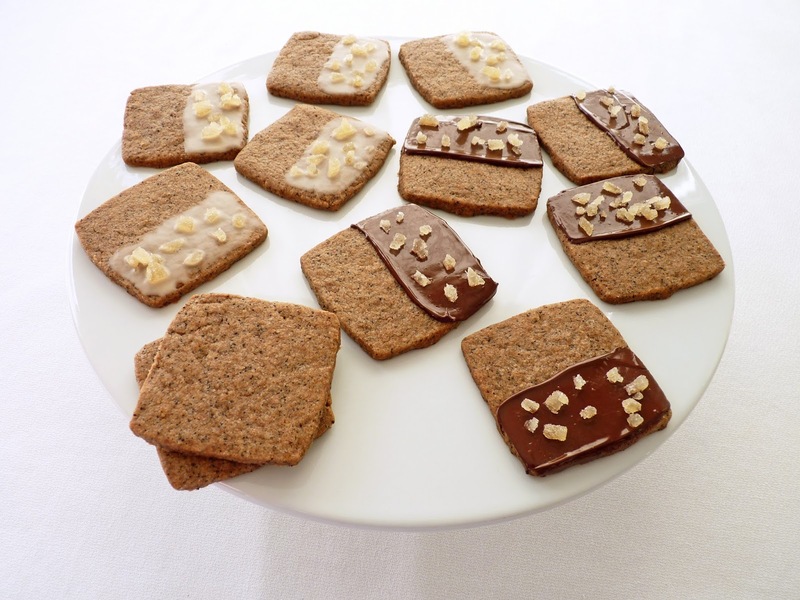 - You might also enjoy Chocolate Espresso Spice Cookies. Preheat to 325 degrees F. Prepare baking sheets with parchment or silpats. Place flour, brown sugar, ground coffee, ginger, cinnamon, cardamom, and salt in a food processor and process to combine. Cut cold butter into 1/2” pieces and add. Pulse until moist clumps begin to form at the center of the bowl. Gather the dough into a ball. Divide dough into two equal portions. Place each on a sheet of plastic wrap and pat it down. Place another sheet of plastic wrap on top and roll out to a rectangle about 7 1/2” x 10”. 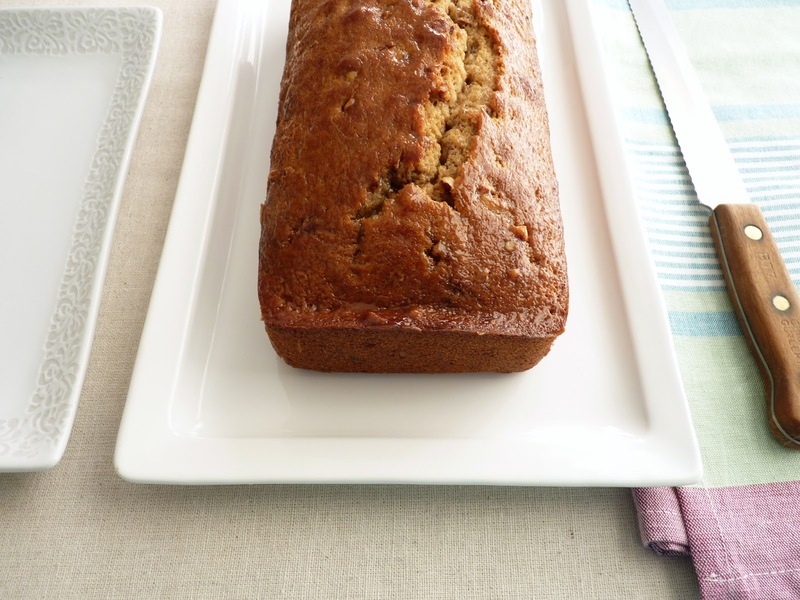 Slide onto a baking sheet and place in the refrigerator. Repeat with second half of dough. Chill until firm. Remove plastic wrap from both sides of cookie dough, leaving one piece underneath. 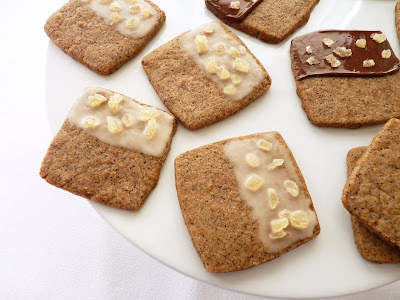 Cut out cookies using a 2 1/2” cookie cutter and place 15 per prepared baking pan. Bake for 20 minutes, rotating baking sheets halfway through. Place on a wire rack to cool completely. Mix the powdered sugar, water and vanilla. 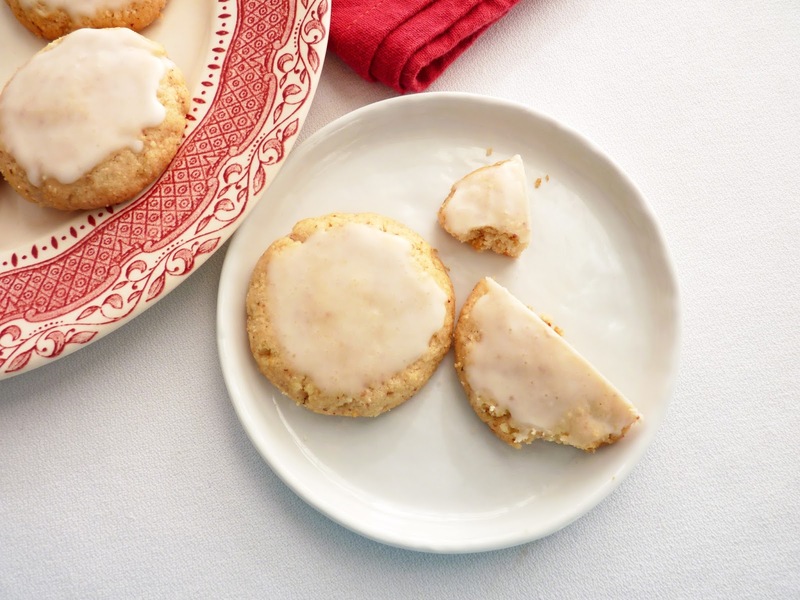 Using a small offset spatula, spread a thin layer of glaze over about half of each cookie. Garnish with crystallized ginger. Place on a wire rack until glaze is set, about 1 hour. If you want to light up a table with a gorgeous blast of color this season, you’d be hard pressed to find anything that could top cranberries. Their bold and bright jeweled saturation, especially when simmered or baked, is pretty stunning. 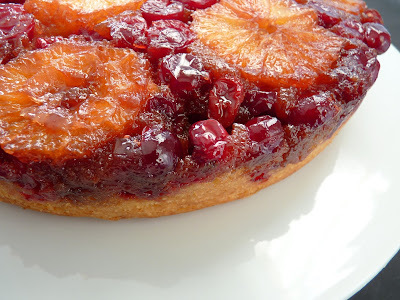 And what better application than to have them crown an upside down cake? 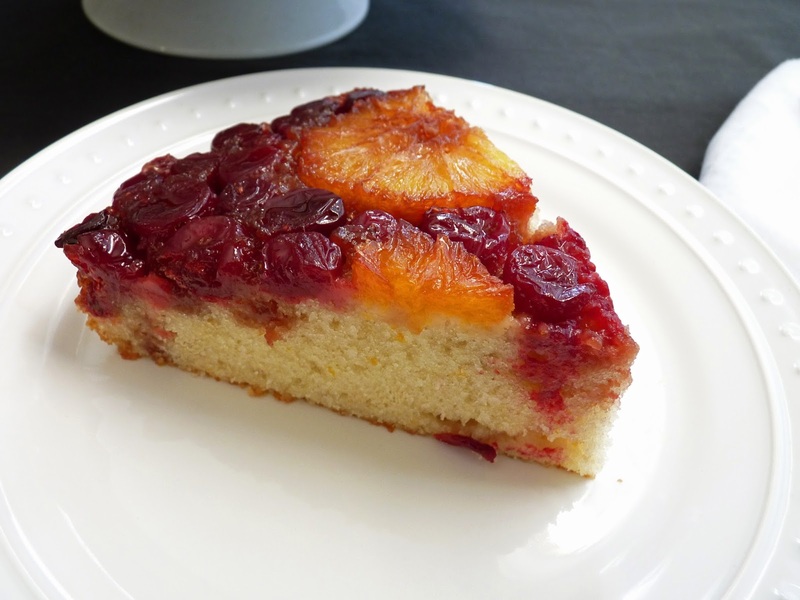 This cake is a simple dessert that highlights not only a gorgeous layer of gooey cranberries but a few slices of the always reliable pop of sunshine of sliced oranges. 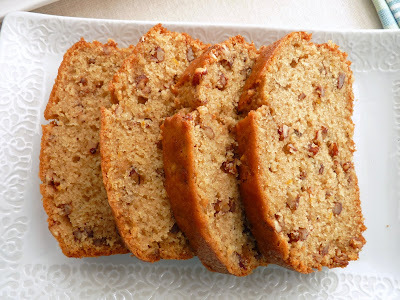 Burrowed in a butter and brown sugar mixture, they bake into a luscious topping for a tender cake laced with vanilla and orange zest. This cake was baked each winter at Chez Panisse for years. It’s rustic and spare but also befitting a centerpiece. It's delicious served with a dollop of sweetened whipped cream enhanced with a splash of vanilla or perhaps Grand Marnier. Here’s wishing everyone a sumptuous and warm Thanksgiving. I hope you are surrounded with irresistibly good food and cherished loved ones, savoring every tidbit in a grand gesture of gratitude. - I bought a medium and a small orange for a fun decorative variation in size. - I line the bottom of the pan with parchment after greasing so the topping releases in one piece. - The amount of cranberries you’ll use will depend on the size of your orange slices. Do crowd the cranberries in one layer as tightly as possible. 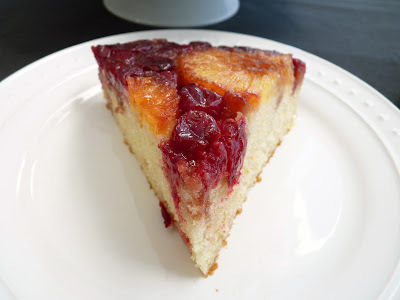 - Although the recipe states a 55 minute bake time, check the cake at 45 minutes. Mine was done, although I suspect my oven is running rather hot these days. - Let the cake cool on a wire rack for about 20 minutes before turning it out. You want the cake to cool enough so that the topping stays in tact but also warm enough so it releases easily. - Add about 1/2 teaspoon of cardamom or cinnamon to the batter for a different flavor profile. Preheat oven to 350 degrees F. Lightly grease a 9” x 2 1/2" cake pan and line the bottom with a circle of parchment. For the topping, melt the butter and pour into the prepared cake pan. Add the brown sugar and blend with the butter until it dissolves. Pat this mixture into an even layer, spreading to the edges of the pan. Use a sharp knife to cut away the peel and pith of each orange, preserving the shape. Cut into 1/4” slices and place randomly on top of the butter and brown sugar topping. Fill in with as many fresh cranberries as you can fit in one layer. Set aside. Sift together the flour, baking powder, and salt. Set aside. Combine the milk, vanilla and orange zest and set aside. Beat the butter and sugar until light and fluffy, about 3 – 4 minutes on an electric mixer. Scrape down the bowl and add the eggs one at a time, mixing until fully incorporated and emulsified before adding the next. Scrape down the bowl. Add the flour mixture in thirds alternately with half the milk, beginning and ending with the flour mixture. Take off the mixer and scrape down the bowl, making sure to scrape the bottom and sides of the bowl to fully incorporate all the fat and dry ingredients. Pour the batter over the topping and spread evenly, taking care not to disturb the fruit. Bake until a tester inserted into the center of the cake comes out clean, about 45 - 55 minutes. Cool for 20 minutes in the pan. Run a thin bladed knife around the circumference to loosen the edges and turn the cake out onto a platter. Gently peel off the parchment and cool. It’s always nice to have a stash of homemade cookies tucked away in a tin to share when friends or family drop by. And now that the holiday season is surely upon us, it’s good to stock up on ideas for little pastries to share at teatime and for gift giving to all those good people you love and appreciate. Homemade cookies, loaf cakes and confections are among the season's cherished receivables. Today’s cookie is of the simple, subtle and crumbly variety. It’s made with ground almonds and brightened with lemon zest that's been processed with granulated sugar for maximum effect. It’s all done in a food processor, which makes quick work of getting the mixing done. The lemon glaze adds just the right touch of sweetness. This plate of cookies is nothing fancy but a nice way to enjoy a moment of friendship at a time of the year that can feel way too busy and a notch stressful. It’s for just those occasions when you crave a light but satisfying nibble rather than the richness of chocolate or something that screams spice. For those understated moments of quiet relief, reach for your favorite hot beverage and one of these little treats. Time to take a deep breath and relish the simple things in life. 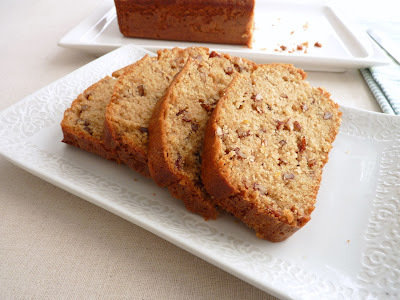 - I like to use sliced almonds because they result in a mixture that is more finely ground. - To toast sliced almonds, spread them out in a single layer on a baking sheet and place in a 350 degree F oven for about 5 – 7 minutes. Watch them closely as they will burn quickly. - A microplane is the best tool for zesting. Zest the lemons directly over the sugar in the food processor to capture the oils. - The cookies don’t take on much color and firm up as they cool. - Sift the powdered sugar for the glaze to eliminate lumps. - I really love the combination of almonds and lemon. If you do, too, be sure to put Lemon Almond Ice Cream on your list of things to do. Pulse sugar and lemon zest in food processor until the sugar is damp and fragrant. Add the toasted sliced almonds and process until finely ground. Add flour and salt and process until thoroughly combined. Cut the cold butter into 1/2” pieces and add to the flour mixture. Add vanilla and almond extracts and process until the mixture starts to clump in the middle of the machine and there are no dry streaks. Place the dough into an airtight container and chill for about 1 hour. Preheat oven to 350 degrees F. Prepare baking sheets with parchment or silpats. Portion the cookie dough into 1 1/4” balls and place 12 on a baking sheet. Gently flatten them until they’re 1 3/4” in diameter. Bake cookies until golden brown on bottom, about 15 minutes. Cool on a wire rack. For the glaze, place the lemon juice in a bowl. Sift the powdered sugar into the lemon juice and whisk to combine. 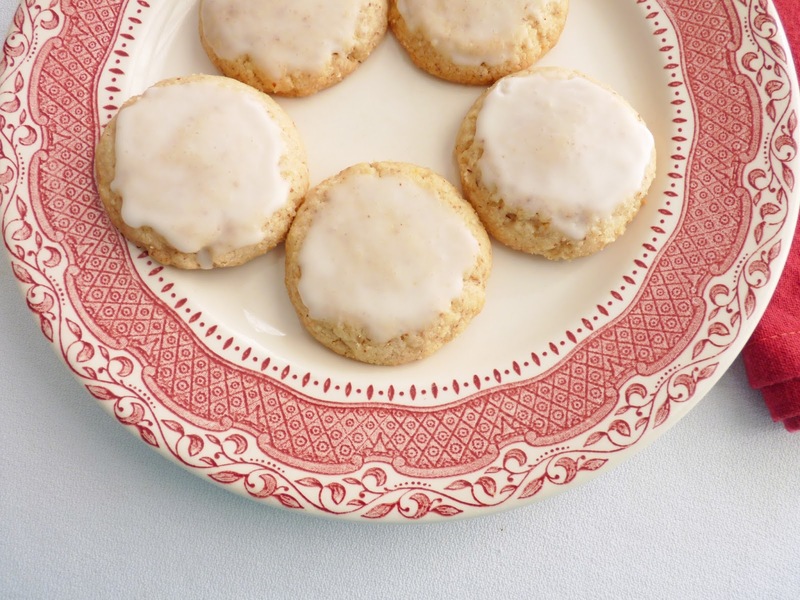 Use a pastry brush to apple a thin coating of glaze on top of the cooled cookies or dip each one into the glaze. Place on a wire rack to dry. With the winter winds rolling in and turning back our clocks to shift from Daylight Savings Time, somehow maple syrup and toasted pecans come to mind. Maybe the fact that maple syrup was first collected and used by Native Americans, it seems like a good time for it to make an appearance for some pastry making. This also feels like the season for loaf cakes. Whether you're making a treat to enjoy with your favorite afternoon beverage or thinking of someone who may appreciate a gift, loaf cakes are a welcome pleasure, a simple and unadorned pastry that comes together in a jiffy without much muss or fuss. 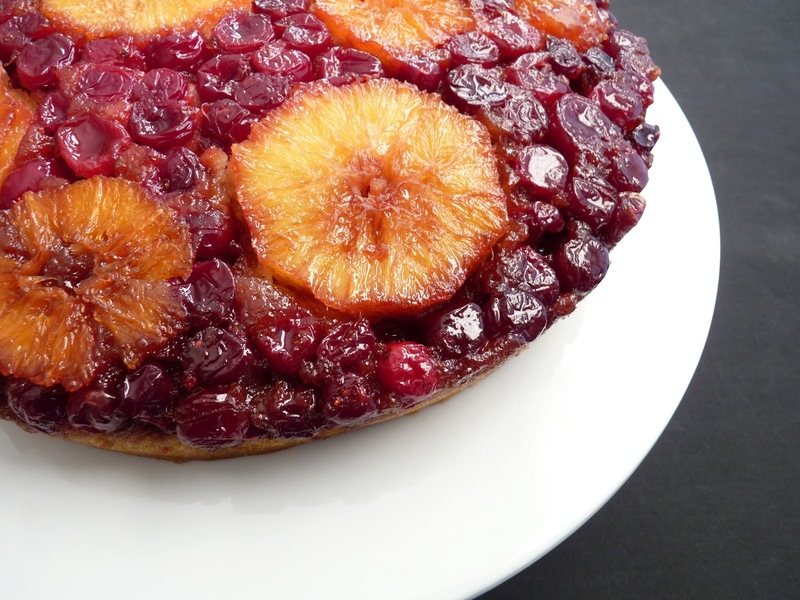 This cake is made using the standard creaming method. There’s a little spice, a good sampling of maple syrup and lots of toasted pecans. Orange zest and a touch of brandy add more flavor and a festive touch appropriate to the season. After the cake is baked, it’s brushed with a mixture of butter and more maple syrup for a nice finish. 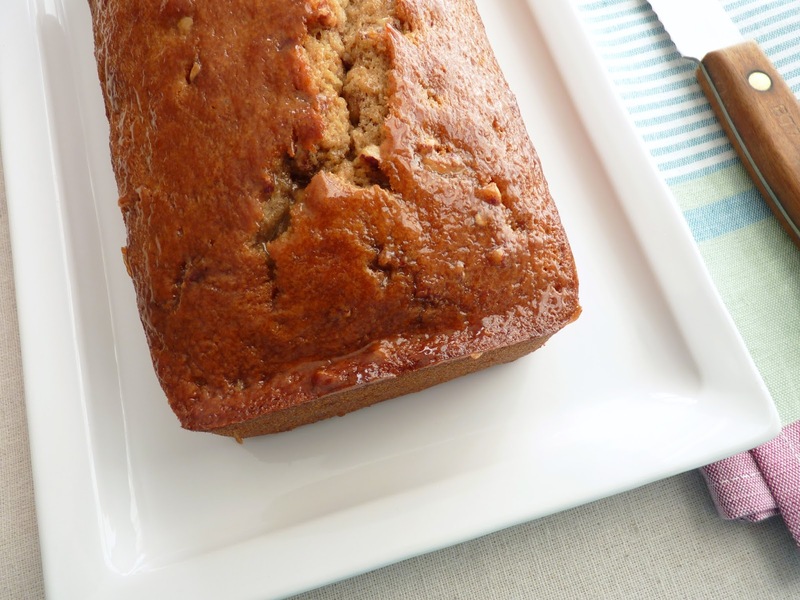 For a sweet nod to autumn, share a slice of this cake. You can always count on a little pastry to liven up your table. - Toast pecans in a single layer on a baking sheet in a 350 degree F oven for about 10 minutes. - "Room temperature" butter means the chill has been take off and it's pliable but not soft to the touch. It should not look oily or greasy. - It's super important to scrape down the bowl often when mixing cake batters to ensure that the fat clinging to the bottom and sides gets fully incorporated into the batter, avoiding streaks of butter that will leave tunnels in your baked cake. - If you're not enamored of pecans, toasted walnuts are a good alternative. Preheat oven to 350 degrees F. Grease an 8 1/2” x 4 1/2” loaf pan and line with a piece of parchment paper large enough to form an overhang along both sides of the length of the pan. Combine milk, brandy, vanilla and orange zest. Set aside. Cream butter and both sugars until light and fluffy, about 3 - 4 minutes. Scrape down the sides of the bowl and add eggs one at a time, making sure that each one is incorporated before adding the next and scraping down the bowl as necessary. Add the dry ingredients in 3 additions, alternating with 1/2 the milk mixture and 1/2 the maple syrup and beginning and ending with the dry ingredients. Mix just until well blended. Fold in the toasted pecans. Pour the mixture into the prepared loaf pan and smooth the surface. Bake the cake until a tester comes out clean when inserted in the middle of the cake, about 50 minutes. Place on a wire rack to cool for 10 minutes. Remove from the pan and cool completely. For the glaze, melt the 1/2 tablespoon butter with 1 tablespoon maple syrup. Brush the top of the loaf with the glaze.